Months of crazy planning. Long hours. Endless to-do lists. In short – a buttload of work to create my pretty little shop. And it all came to a screeching halt a week ago when an electrical fire 3 floors above my shop triggered the building’s sprinkler systems. You know what that means, right? What the fire started upstairs, the water finished downstairs. The poor tenants directly under the fire? Homeless. And jobless too since their livelihood was stored in the computers the water dumped on first. The school offices above me? Destroyed. They were wading ankle deep in water trying to salvage their computers when I got there the night of the fire/flood. They risked their lives to save their data by pulling plugs in the middle of that wet mess. Dangerous? Incredibly. Yes, they suffered some nasty shocks while pulling plugs, but they saved their data and have been struggling valiantly since to keep their music and art programs running. And me? Well, it’s nothing compared to the devastation upstairs. But still, the shop is now closed. Don’t know when I’ll be able to reopen. We’re all fearful of mold in those damp walls. The repairs I’m hearing about include things like “gutting” and “new walls and ceilings.” So for me, this has been a week of salvaging, sorting, lots of e-mails and all sorts of administrative stuff (my favorite). Oh, and everything I salvaged from the shop has now taken up residence in my living room. It’s been a crappy week. And you know what I keep thinking about? When my son, Simon, was about 7 years old, he was completely Lego-crazy. He obsessed endlessly over the stuff. He loved piecing together and playing with all those intricate Lego sets. There was this one time he spent days putting together Boba Fett’s ship. He was so excited about the project. I watched him work through pages of instruction to build the ship brick by Lego brick. Finally he finished. He picked it up to show me… and I think he tripped… but no matter the exact reason… The result was that he dropped Boba Fett’s ship. And in that moment, when all those pieces hit the floor and the entire construction fell completely apart, I saw Simon’s heart break a little. I felt so awful for him. The kid’s face crumpled. He didn’t even bend down to pick up the pieces. I did it for him. Then I spent the next 2 days putting the thing back together again for him. But you know what? The boy never played with Boba Fett’s ship again. Now back to the mess I find myself currently mired in. It was the morning after. I’d spent hours bagging everything I could into plastic in the middle of the night. My boys woke up to find me weeping over the whole thing. I explained what had happened the night before. They both hugged me and tried to comfort me. They both knew exactly what I was talking about. “It’s ok, Moms,” they said. “But Simon never played with Boba Fett’s ship again,” I replied. “Because I was scared of it,” came Simon’s response. It was my turn to choose our read aloud. 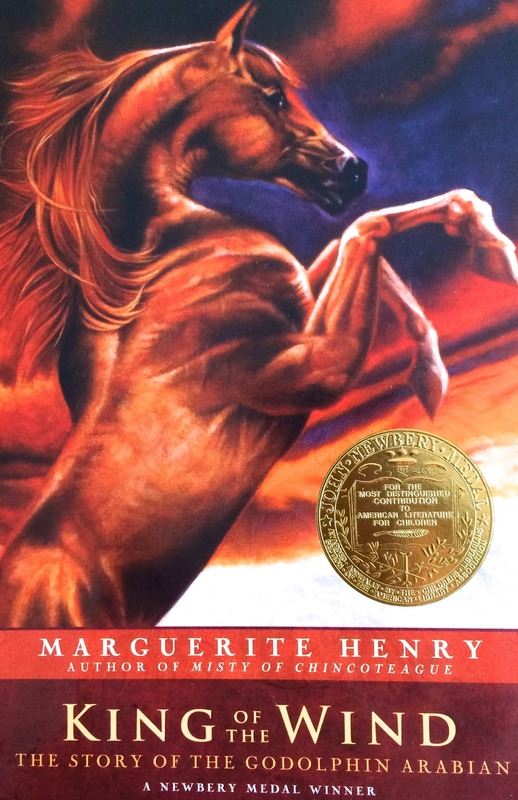 I picked up a copy of “King of the Wind” by Marguerite Henry. Twenty chapters later (and almost finished with the book), they begrudgingly admitted it wasn’t so bad after all. And could I please read another chapter? We had a bit of a rocky start with this read aloud. For the first ever, my boys traveled without me. They had a three day head start on our mid-winter holiday. So, for three days, I read aloud to them over the phone. I love it when my kids’ eyes light up over a new book from a favorite author. I’ve been pretty darn amazed over the details they remember from previous read alouds. And, I think, the best is when they pick up books we’ve read together and read it all over again for themselves. All three of the above have happened with the Adam Gidwitz books. My younger boy actually sprinted across the store to grab this book when it first came out (we couldn’t read it immediately because we were still in the throes of the Percy Jackson series). 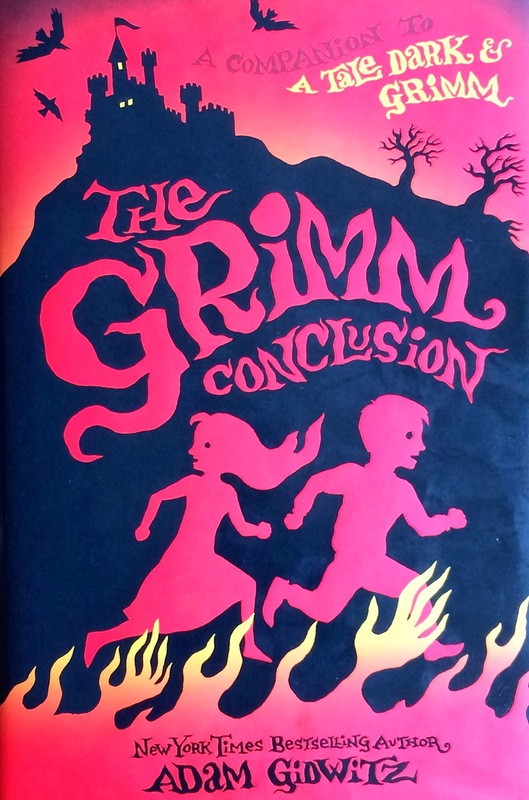 “The Grimm Conclusion” references parts of the first two stories. I confess to forgetting what happened all those many read alouds ago… but both boys jumped in to fill in the details. And, already, E is telling me he’ll be reading the series again soon. Though my blogging has been sporadic these months, the reading streak continues on. Long live the reading streak!